Have you had a good lemon cake that was really lemony? I haven't and so when i bumped into this recipe i just HAD to make it. The thing is, there is a wedding coming up in December and i have some major post-pregnancy fat the size of a dirt truck tires around my waist and so i'm like slightly totally obese. For obvious reasons hubby and i have consciously been cutting down on our rice intake and also sweet treats. I do have a lot to shed..phew!!! Thankfully i haven't been so kicked about cakes and cookies lately and so it was good. BUT today it was a different story, i craved and craved for something sweet & sour, in a really non-pregnant sort of way ;) and then i saw this and i knew i had to bite into this today or else i'd die :). Why this cake? Because it has two things i love in it, Lemon & Honey. Back at home we get lemon the size of oranges, it is juicy, sour with a tinge of sweetness and amazing scent... sniff.. sniff. 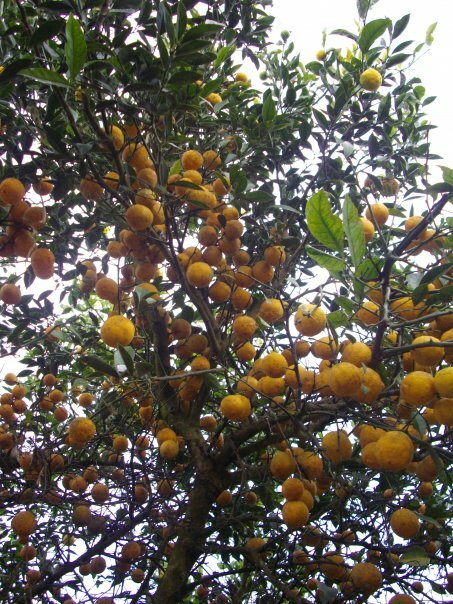 Ukhrul District in Manipur, inhibited by the Tangkhul Nagas, celebrates Lemon Festival every year in the month of January...that is how much we north-easterners love lemon. Unfortunately, lemon do not even exist down south, all we get are these tart and small lime. I have lived in Bangalore for 5 years and now in Hyderabad and am yet to spot any lemon...so i guess it is non existent this side of the country. Coming back to the cake, you should check Elise at Simply Recipes, the source, the power, the hand behind this cake recipe. She made a loaf out of this recipe but yea, me being the rebel, decided to make a bunt cake. Bunt, loaf or round, it will just be one great lemony treat. Preheat oven at 180 C, grease a bunt pan and keep aside. Sieve the first 3 ingredients and keep aside. Cream the butter, add sugar and honey and beat until creamy. Add eggs one at a time, beating after each addition to incorporate, the add the milk, mix and then fold in the lime zest and give it a gentle mixing using a spatula. Add this wet mixture into the bowl with the dry ingredients and blend till smooth. Pour the batter into the bunt pan, smoothen the surface of the cake and bake it in the preheated oven for 25-30 minutes (baking time will differ and depend on different oven temperature) or till a toothpick inserted in the middle comes out clean. While the cake is baking, prepare the glaze by adding all the ingredient into a sauce pan and boiling till all the sugar is dissolved. Keep aside. Once cake is done, pock holes using a toothpick or skewer or a tip of a knife (like me :0) and spoon the syrup all over the cake, while the cake is still in the pan and hot. Then let cool for sometime, invert, cut and gobble. To celebrate the sweet ( i have a loving and very considerate husband and a healthy son) and sour ( i am obese) in our life, this is the perfect cake. Enjoy!